THIS GIVEAWAY HAS ENDED AND THE WINNERS HAVE BEEN ANNOUNCED ON THE DISCORD! 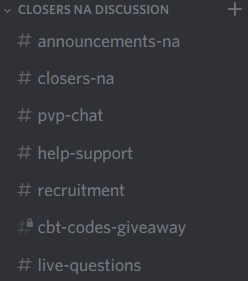 Alright people, we will now begin the first giveaway of Closers NA CBT Codes! These are just buddy codes and not founder packs, so all these will do is to give you access to CBT, but no other founder rewards. We will potentially be giving founder packs, but this first one will just be three buddy codes for the CBT access. I plan to at least have 5 parts of giveaway, and each requiring a different kind of... challenge. Sure, I could have the giveaway just be a random raffle where everyone pitches in, but that's no fun, is it? Although I would very much like to do this giveaway per ClosersHQ tradition and make it a Scavenger Hunt... Since most of the people who want these CBT codes wouldn't have been playing Closers KR in the first place, we'll just do a simple challenge to participate. So, here are the steps to enter the raffle for the first giveaway! First challenge will be dedicated to Sylvi...! 4. In that channel, post any kind of picture for Sylvi- regardless of screenshot, fanart, official illustration, etc. Do NOT post a NSFW art! 7. You are done! Winners will be picked on November 6th, 8:00 PM PST, which is before CBT starts on November 7th. So make sure to enter the raffle before then. We will also be having continuous giveaways throughout CBT for those who haven't won the giveaway, so watch out for Part 2 or Part 3 giveaways to come. And I ensure you, they will come soon.